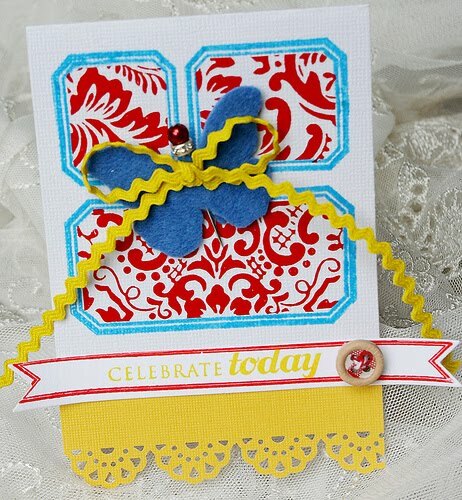 I used Jenni's label stamps to create the background of this design. 1) Stamp the background onto white cardstock with ink. (I used royal blue pigment ink for a color pop). 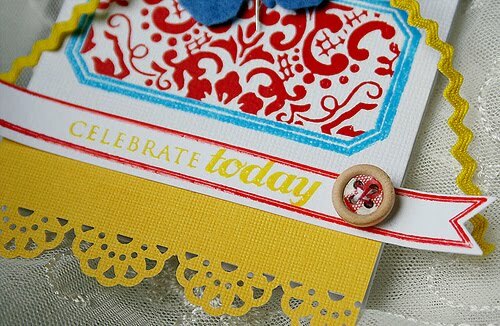 2) Apply embossing powder when the ink is still wet, shaking off the excess onto a piece of paper. Heat emboss the image until it "sets". 3) Using mini post it notes (I used 2" x 1.5" notes) mask off the large label (the large horizontal one that is under the two smaller labels) by placing mini post it notes over the blue stamped outlined edges, leaving the center of the label free to receive the rubon application. 4) Apply Jenni's red damask rubon to the area left after the edges have been masked off. 5) Use a slightly dull xacto knife to lightly trim the edges where the rubons meet the post it note, so that when you lift the note, it won't tear off any of the rubon image within the label box. 6) Repeat steps 3- 5 with each of the remaining two boxes. Make sure that you are not applying the sticky part of the post it note to any area where you have applied a rubon or it will pull it off. 7) Now finish off the card with trim, buttons etc. I added the stamped banner and sentiment and the wooden button, some trim, a JBS stick pin and a JBS felt butterfly from my stash. I topped it off with a bright yellow rick rack bow for an extra punch of color. 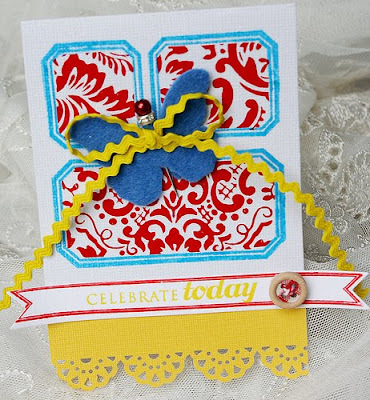 Beautiful card, thank you for the tutorial.